Vasily Maximov, a native of the peasant environment, devoted his whole life to depicting the life of ordinary Russian tillers. Portraits occupy a special place in the art gallery of the author. There are images of old and old women, women and men, and especially village children. 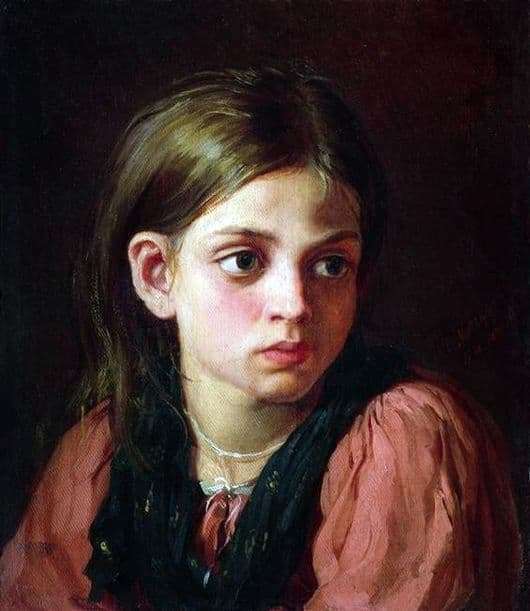 The painting “Girl” was painted by the artist in 1866, when he left the Academy of Arts and lives in Shubino on the estate of P. P. Golenischevoy-Kutuzova. Here he observes the life of the peasants, “fills” his hand and works out his author’s style. At this time, the decision comes to him to draw “living” people. In creating the image of a peasant girl, the author’s inexperience is not felt. Skillfully selected colors, traced lines, details, the location of light and shadow – everything speaks of the artist’s deep understanding of this image. A teenage girl is drawn by a master for some occupation, during which she was distracted by a phrase that interested her. We see the face of an intelligent, sensible girl, an adult of no age. In fact, she is still a child, but in the expression of her face does not feel childish. On the contrary, there are fatigue, endured trials, the burden of work and daily life. Especially expressive are the girl’s huge bulging eyes. The child’s gaze is intelligent, serious, thoughtful. There is interest in what is happening outside the picture. When you look at a girl, you imagine that she is sitting with you in a room and attentively listening to what you say to her. But at the same time, she perceives your speech somewhat condescendingly, because she knows more about life than you do. The seriousness, the concentration of facial expressions, the absence of a smile on the plump shifted lips speak about some of the concerns of a teenager. Perhaps she was distracted from the task of responsibility. We do not see the hands of a girl, but we feel that she does not spend time in idleness. In this portrait the artist represents a lively image of a girl.